For the first time in the industry, Averitt has integrated an LCL service with an LTL network. The result? The Asia-Memphis Express and Asia-Dallas Express, our direct import LCL services from Asia. Through this innovative combination of ocean service and inland transportation, we can provide unparalleled speed, delivery consistency and seamlessness on your LCL shipments – all at a competitive price! The Asia Express offers direct import delivery and distribution services to markets in Dallas, Memphis and surrounding states. Click on the images below to learn more, including transit times to points throughout the south. The process is simple. We load containers in Asia and book them all the way to our bonded CFS service centers in Memphis, TN and Dallas, TX. After passing through the ports of Los Angeles and Long Beach, the containers immediately move by rail to Dallas and Memphis. From our secure facilities, we deconsolidate the cargo and blast it through our LTL distribution network directly to your door. With most traditional LCL services, cargo is consolidated at origin and deconsolidated at the first port of entry, increasing the risk of delay. With our system, our exclusive relationships with partners in Asia give us the critical mass we need to ship LCL containers on a fixed schedule directly to Dallas and Memphis. At the first port of entry, we don't stop and hold LCL shipments until we have a full load of cargo for a certain destination. Because we regularly load containers bound for the South via Dallas and Memphis, we can avoid these delays. Our containers don't have to wait at the port to clear customs. We can immediately transport them to our CFS-bonded distribution centers in Dallas and Memphis, where we efficiently process the cargo and quickly push it through our robust LTL distribution network. Moving your cargo through Dallas and Memphis has its advantages. These facilities are among our largest and most secure. And because we are the South's leading carrier, no provider in the industry can get to you faster. Importing may seem overwhelming at first. Fortunately, Averitt can handle the majority of the work that is necessary to get your cargo onto a ship or in the air and through U.S. customs without a hitch. All of this translates into an LCL service that is faster than any traditional LCL service in the market. The Asia-Dallas and Asia-Memphis Express services can help cut your LCL transit times by up to 10 days. Get your goods to market in record time - and pay the same price you do with traditional LCL service. We can give you the delivery consistency you need to keep your supply chain costs down. No need to keep higher safety stock inventory levels or resort to air freight to recover from random delays. Through our North America less-than-truckload and truckload partners, we can provide this LCL service from Asia to any point in in the United States, Canada and Mexico. Our international customer service specialists are constantly monitoring your cargo so you can know the exact location of your shipments at any time. Web-based visibility is also available. View Map and Transit Times Now! If you have any questions or would like to speak with a member of our retail team, please fill out the form and we will contact you shortly. 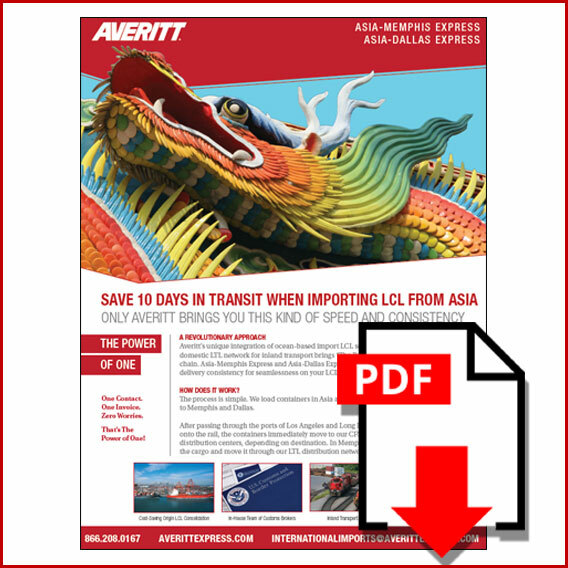 Additionally, you can reach out directly to Averitt's International Team at 1-866-208-0167 or internationalimports@averittexpress.com.